According to the Mills list, this yacht was owned by E. Harris, Toronto, in 1901, by Charles W. Archer in 1921, Mariner, Bracebridge, Ontario, and by J. C. Scriber, Huntsville, 1928. 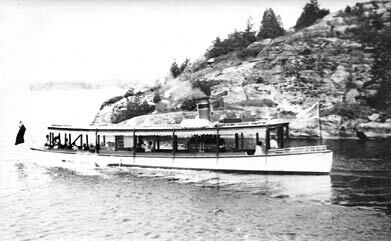 Mills List also notes that it was badly damaged by fire on May 4, 1925 in Braceridge, and rebuilt as a tug. The vessel was destroyed in 1936 but not dropped from the Dominion list of ships until 1946. "Near Muskoka Wharf, summer 1918"